On Facebook: Just type Dunn’s Marsh into the Facebook search box. Editor’s Note: This issue features many attachments. If your e-mail program appends the first page of attachments to the end of your e-mail, get a visual preview of the e-News by going there first. 3 - DMNA Council Authorizes 6 Committees for the Coming Year. Will You Join One? 15 - Winter Enrichment Nature Lectures Start January 10. Register now. 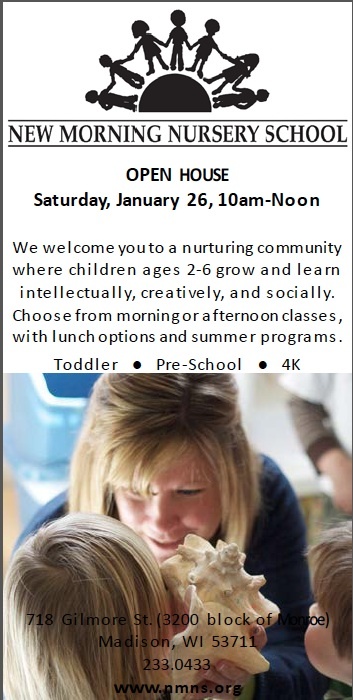 If you need a nursery school for your young child, check out the attached advertisement for the New Morning Nursery School. The school is located at 718 Gilmore Street, at the 3200 block of Monroe Street. On October 17, Dunn’s Marsh Neighborhood Association members attending the DMNA annual meeting elected the 2012-2013 DMNA Council. Seven Council members were elected that night. 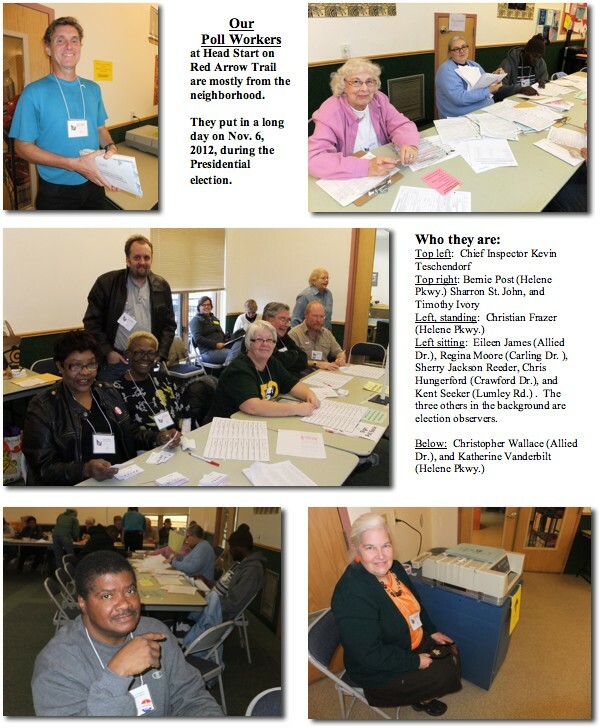 Later one resigned, but 3 more were chosen at the first meeting of the Council on November 8, resulting in a Council of 9 neighbors. We are very happy for our new members as well as those who chose to continue serving. For the first time in years all 4 parts of the neighborhood are represented on the Council. Below is the list of Council members along with their contact information and the committees they’ve volunteered to join. The Council can have 3 more representatives. If you are interested in joining with your neighbors to work for the good of the neighborhood, please contact President Bob Hague or Communications person Mary Mullen. DMNA Neighborhood Council, 2012-2013, elected at the annual meeting October 17, 2012 or appointed by the Council on 11/8/12 . These Council members will serve until September or October 2013. David is also on these committees: Safety & Law Enforcement Committee, Transportation & Streets Committee, and Communications Committee. Lynette is also on the Communications Committee. Thea is on the Welcoming & Social Committee. Burree Beaudoin, 278-7956, 2017 Danbury St.
Jon Holmes, 445-6339, 4313 Lumley Rd. Jon is on the Safety & Law Enforcement Committee and the Marsh Preservation Committee. 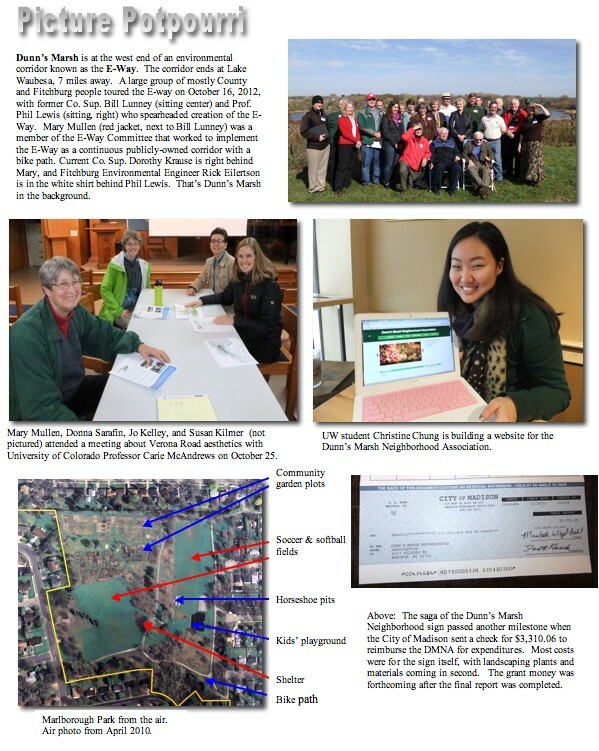 Mary is the contact person for the Dunn’s Marsh Neighborhood e-News, and is on the following committees: Communications Committee, Transportation & Streets Committee, the Marsh Preservation Committee, and the Welcoming & Social Committee. Donna is on the Communications Committee and the Transportation & Streets Committee. Many thanks to the “retiring” member of the Council, Jo Kelley, who brought a wealth of experience, several initiatives, and a calm presence to our governing body. 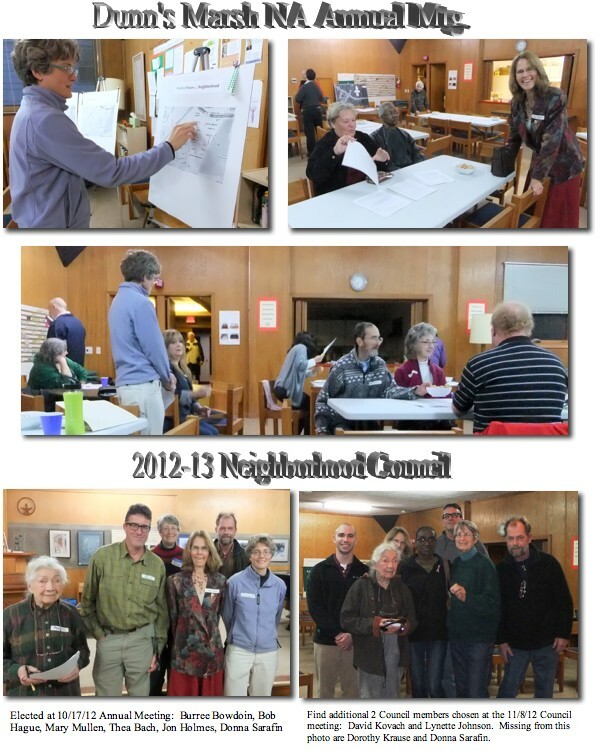 At its first meeting of the 2012-2013 year, the DMNA Council authorized 5 standing committees to look after the welfare of the neighborhood. They are noted below along with the Council members who volunteered to be on each committee. While we have this group of “starter members” for each committee, we welcome neighbors from any part of the neighborhood to join any of these committees. It’s through strength of numbers that we can really accomplish what’s necessary to improve the Dunn’s Marsh Neighborhood. Any resident, whether a member of the DMNA or not, may become a member of a committee. At an organizational meeting of each committee, a chair will be chosen. Bylaws require the chair to be a member of the Association, but it is extremely simple to join the Association. These are the committees and the Council members who have volunteered for each. Communications Committee - Mary Mullen, Lynette Johnson, and Donna Sarafin. Contact DMNA President Bob Hague or Communications person Mary Mullen if you wish to join one of these committees. Contact information is in the previous article and in the masthead. 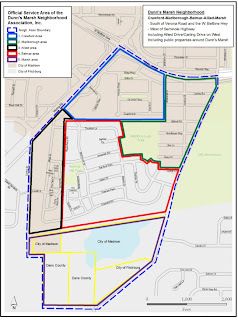 The proposed expansion of the Dunn’s Marsh Neighborhood Association boundaries to include Dunn’s Marsh and other public lands below the Cannonball Path was approved by members of the DMNA who attended the annual meeting on October 17, 2012. We now have an enhanced map of the complete service area, developed by staff at the Madison City Planning Department. Many thanks to Sherri Milleville. Whereas our older map didn’t show the many new streets in the western part of the neighborhood, the new map shows all of them, along with their names. It also shows park areas in green tones and distinguishes between areas within the City of Madison and those within Fitchburg. The delineation of jurisdictions is important when contacting government about issues and also for knowing where to vote. The new map also has a scale notation. The scale shows that our neighborhood is about 3,300 feet across at its widest part and 6,400 feet from north to south. That translates to 6/10 of a mile wide and 1.2 miles long. Because he area below the Cannonball Path has no residents, expanding the boundaries has not added anything to the workload of the DMNA. The rationale for adding the public lands was that the DMNA takes its name from Dunn’s Marsh, the DMNA has always advocated for Dunn’s Marsh and the public lands surrounding it, and in fact, the DMNA has been a catalyst in acquiring some of these public lands. DMNA Council meeting dates have been scheduled for the coming 2 months. Both will be on Thursday nights, 7 p.m., at Prairie UU Society, 2010 Crawford Drive. Any resident may attend these meetings. Please let our President Bob Hague know of your interest in attending and if you have a subject you’d like to bring to the attention of the Council. After about 10 months of working toward getting several Little Free Libraries in the Dunn’s Marsh Neighborhood, two LFLs have been installed. Both are in the Marlborough part of the neighborhood, and both were put up on October 16. The first is at the corner of Danbury and Lumley. Hosts for this library are Kim and Jason Anderson. Their library boasts a combination of design features: barn board sides, a kitchen-cupboard-like front, and a rustic natural wood handle. That LFL is a two-decker. The other LFL is located in front of Prairie Unitarian Universalist Society, 2010 Whenona Drive. It’s a single-decker, painted to match the church. It is sponsored by Prairie UU. 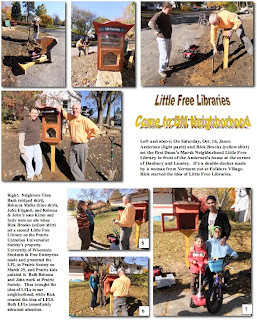 Both hosts report that their Little Free Libraries are doing a brisk business. We need to thank DMNA Council Member Thea Bach for bringing LFLs to the neighborhood. She has worked hard to get them. Also thanks is due to LFL inventor Rick Brooks who provided the actual library boxes and the posts and hardware to set them up. Rick also came on October 16 with all his equipment to help install the posts and libraries. Another LFL is planned for Marlborough Park, and a couple may also be installed on Allied Drive. Marlborough Community Garden leaders met last Friday to evaluate this past summer’s garden performance and plan for the 2013 season. Several attendees spoke up for activities for children, and the group decided how to handle the fact that many gardeners did not attend any workday. The committee also discussed what to do with gardeners who neglected their plots. In addition, it was affirmed that 45 plots of the tilled garden would be converted to no-till status. They are plots from row 13 through 21 on the west end of the garden. That leaves 60 plots on the east end of the main garden that will be tilled by tractor and plow in the spring. The garden committee decided that programs or equipment for children would be developed and paid for only if volunteers from the garden step forward to plan and run them and the leadership committee approves the program and expenditures. This applies to any other programs that gardeners want to initiate. -a fine for those who did not show up during 2012. Garden leaders felt that a deposit would punish those who are responsible, would require too much work to return, and would raise the price of gardening unnecessarily. They decided that a fine would be fairer. Thus, a $10 fine will be attached to the garden registration fee of those who came to no workdays in 2012 when those same gardeners register for a 2013 garden. In 2014, the fine will be raised to $20 for those who don’t come to any workdays, but will stay at $10 for those who come to one of the two workdays. Regarding maintenance issues, a priority list will be established for the 2013 garden. Those who kept their gardens well-maintained will get precedence on the list. Those who totally neglected their plots will have reduced garden space if they had 2 or more plots. Neglectful gardeners who had only one plot will go to the bottom of the priority list and will get a plot only after the waiting list has been exhausted. The gardeners who attended this committee meeting were the garden manager Pablo Granados; 3 Spanish-speaking women, Clara, Mara,and Angelica; and 2 English-speaking women, Dawn Lalor and Mary Mullen. The meeting was led by CAC garden advisor Micah Kloppenburg. The committee will be meeting again to discuss additional issues. Any new gardener who wants to be put on the list for a 2013 plot should contact Micah Kloppenburg, michak@cacscw.org or call (608) 246-4730, Ext. 236. “Old” gardeners with a good record of maintenance are already guaranteed space in the garden. The final chapter in the saga of the Dunn’s Marsh neighborhood sign wrapped up with the receipt by the DMNA of a check for $3,310.06 from the City of Madison. The check represented all the out-of-pocket expenses the Dunn’s Marsh Neighborhood Association incurred in getting the sign. What wasn’t paid for was all the volunteer time. A total of 67 hours of volunteer time were logged for this project, but in actuality neighbors spent quite a bit more time if driving time to attend meetings and unlogged time prior to this year had been counted. For purposes of the report, we only logged time in 2012. Efforts from 2008 through the beginning of 2011 went unnoted because that work came to nought. Expenditures included $2,954 for sign design, manufacture, and setting; $163.66 for topsoil, mulch, and delivery of same; $142.40 for plantings around the sign; and $50 for the sign permit. Last August, the Cannonball Path design by Fitchburg Public Works staff was modified by Common Council to remove the safety island at Seminole Highway, and approved in Resolution R-77-12. The adopted resolution provided for path-user-activated flashing caution lights at the Cannonball and Capital City Trail crossings. Subsequently, I developed and the Mayor introduced another design proposal, with a safety island at the Cannonball Path crossing and path-user-actuated flashing beacons at both the Cannonball Path and Capital City State Trail crossings of Seminole Highway. That design, as Resolution R-88-12, was referred to four city bodies over the last two months, and was back before the Common Council last night. I am pleased to report that we are back to the staff-recommended design, including the safety island at the Seminole Crossing, and that R-88-12 has passed, however without the user-activated flashing lights. 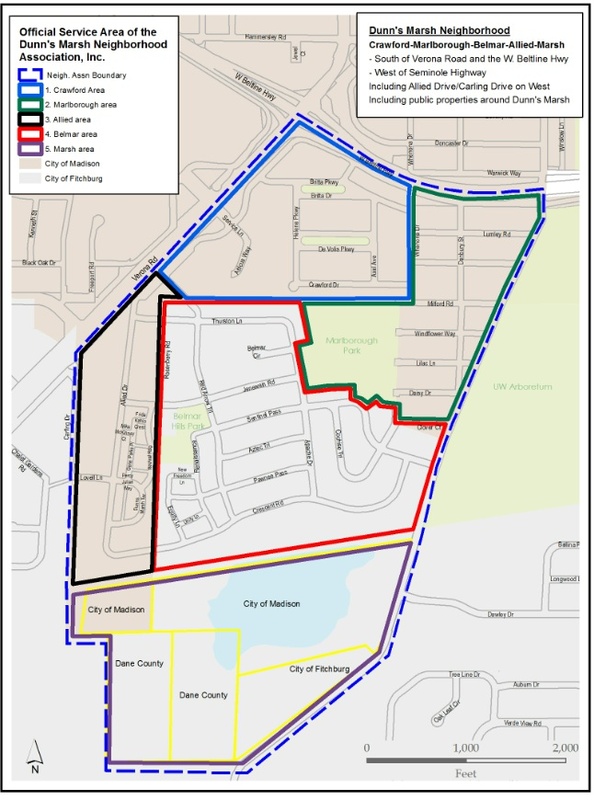 Other project features include a ten-foot wide path from McKee Road near Verona Road to the City of Madison portion south of Arbor Hills, way-finding signage, and a connecting boardwalk to the Dunn’s Marsh neighborhood and points north. The project will be constructed in 2013. The Council also signaled its willingness to fund and install path-user-actuated flashing beacons at the two crossings in the future, should they prove to be necessary. Please join me in thanking Mayor Shawn Pfaff and my colleagues on the Common Council for funding the local share of this important bicycle transportation project and for restoring the safety island to the Seminole crossing! Funding also includes the City of Madison's local share and Transportation Enhancement funding from the U.S. Department of Transportation. The only alders who voted for retaining the user-activated flashing caution lights were Steve Arnold and Dorothy Krause. The alders who voted favorably on the final motion including the island were Steve Arnold, Becky Baumbach, Richard Bloomquist, Dorothy Krause, Carol Poole, and Patrick Stern. Carol Poole and Dorothy Krause are Fitchburg District 1 alders who live in the Fitchburg part of the Dunn’s Marsh Neighborhood, and we heartily thank them both for their support. Voting against the final motion that included the safety island were Denise Solie and Swami Swaminathan. Several alders changed their vote to favor the island in the months between the first and second resolutions. DMNA work on this issue was in the mix that brought this safety feature back. The DMNA favored the original staff recommendation for the island as well as the user-activated flashing lights. 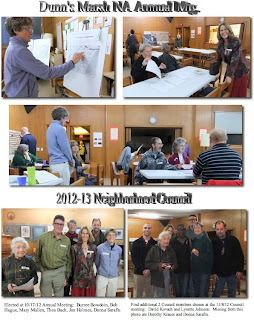 This past year has been a very active one for the Dunn’s Marsh Neighborhood Association. Please check out this list to see what we’ve accomplished and who has made it happen. Recognition is given to those who attended meetings related to the work of the DMNA, made phone calls, wrote e-mails or letters, or did outreach in the neighborhood. Not listed are residents who simply came to a neighborhood meeting or the picnic, but they too helped make this year a success. In a response to a notice in a UW campus publication, student Christine Chung volunteered to help the Dunn’s Marsh Neighborhood Association get its independent website up and running. Already she has set up the organizational structure of the site, put in some content, and given a lesson on how to add new material. The site has not yet gone live. Christine is a senior at UW-Madison, majoring in Spanish and Journalism, expecting to graduate in December 2012. Currently she is a Web & Communications Assistant at University Health Services. In addition to her web design skills, she brings other interesting background to the job. She has intermediate skill at speaking Korean. A few years ago she was summer Public Outreach Volunteer in the Public Affairs Office in the U.S. Embassy in Kazakhstan and more recently she worked as an International Admissions Counselor Assistant in the Admissions Office at the UW. She adds that in her spare time, she likes to hang out with friends, go to the movies, read, discover new places to eat and occasionally blog. She looks forward to working with Mary Mullen and the rest of the members of the neighborhood association. The November 6 election is long past, but perhaps there are a few of you out there who would like to know exactly how the vote played out in our neighborhood. In Dane County, 68.83% of voters filled in the arrow for President Obama while 29.4% voted for Mr. Romney. Other candidates got 1.4% of the total votes for president. 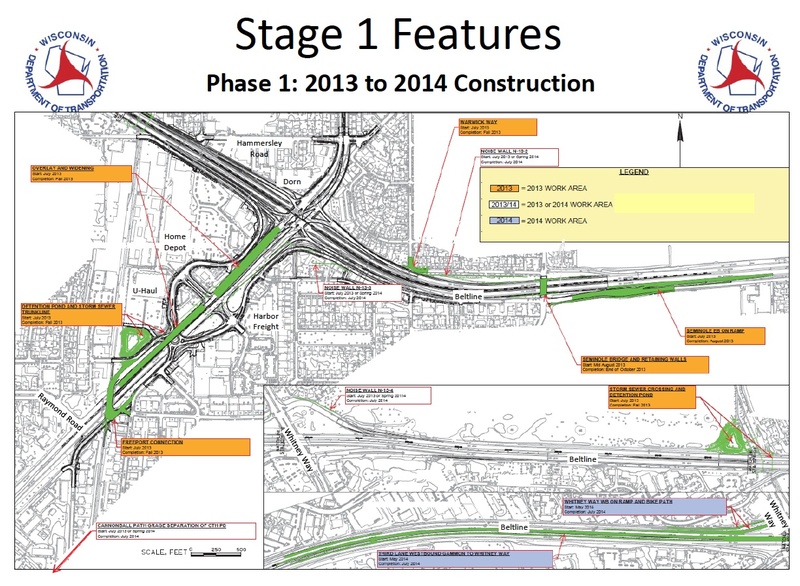 Have you been wondering when construction will start on the massive overhaul of the Verona Road/Beltline project? Wonder no more. The following timetable was presented at the Verona Road Public Information Meeting on November 13. However, a more recent newspaper headline suggested that these schedules might slip a year due to state budget considerations. Action will start in 2013 with work on the southbound lane of Verona Road, the detention area near U-Haul, the area along Warwick Way across from our neighborhood, the Seminole Highway Bridge, access lanes to the Beltline next to the Arboretum, and several places more distant from the Dunn’s Marsh Neighborhood. More detail is presented in list form below and in visual form on the attachment which is a map. · Widening and repaving (overlay of the southbound lane of Verona Road from the Beltline to Allied Drive area. There will be 4 lanes built here to accommodate traffic during Verona Road construction. · Building a road from Allied Drive and under the Verona Road underpass - currently just a bike path - to connect to Freeport Road and the Verona Frontage Road on the west side of Verona Road. This is called the Freeport Connection. · Work on the curve from Warwick Way to Whenona Drive in the vicinity of where the ped/bike overpass comes down opposite our neighborhood. 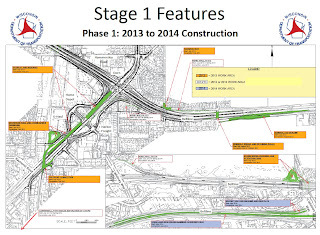 · Redoing the Seminole on-ramp to the eastbound Beltline along the Arboretum. This appears to be a widening project. · Cannonball Bike Path grade separation over County PD. Currently, this will be an overpass of PD. · Third land added on westbound Beltline from Whitney Way to Gammon Road. These timetables were presented at the Verona Road Public Information Meeting held on November 13 at Cherokee Middle School. The presenters were Mark Vesperman of the Wisconsin Department of Transportation (WisDOT) and Joe Bunker of Strand Associates, the consultant for the project. Additional information on the entire project is accessible from http://www.dot.wisconsin.gov/projects/swregion/18151/ This includes photos and information about work to be done on intersections more distant from the project such as those at Seminole/Sentinel Pass, Seminole/PD, and Seminole/Nakoma Road and others. Additional Fitchburg Green Thursday Events scheduled through May 2013 are at: https://docs.google.com/file/d/0B-ZCkIcrL_zaRzdsSWpDaEJHMWs/edit <file://localhost/file/d/0B-ZCkIcrL_zaRzdsSWpDaEJHMWs/edit . A video of the Oct. 4th "What's Up w/ our P- Nutrient Recycling in Fitchburg and Dane County" presentation is now available at: http://factv.city.fitchburg.wi.us/Cablecast/Public/Show.aspx?ChannelID=1&ShowID=2013 <http://factv.city.fitchburg.wi.us/Cablecast/Public/Show.aspx?ChannelID=1&amp;ShowID=2013> . Special guests George Dreckmann, Recycling Coordinator for the City of Madison, and Rick Eilertson, Environmental Engineer for the City of Fitchburg, will share what's going on in their communities (e.g. Solid Waste Sorts, Organics Collection Pilots, etc.). More information on Green Tuesday and Thursday events scheduled throughout Dane County can be found at: http://www.tnsmonona.org/green-tuesdays-green-thursdays/ <http://www.tnsmonona.org/green-tuesdays-green-thursdays/> . 4. Eco Book Group - Tues., Dec. 18 (from 6 - 7 pm) - Fitchburg Library (5530 Lacy Rd) - Join us for a discussion of a book related to energy conservation. The title of the book is to be determined. Check www.enactwi.org or contact Jamie Hernandez at jamie.hernandez@city.fitchburg.wi.us or 729-1763 for more information as this event approaches. 5. Our "Fitchburg_Green" E-News Mailing List is up and running. Blind copy recipients will be excluded from future "Fitchburg_Green" E-news Blasts unless you subscribe to the "Fitchburg_Green" Mailing List following the directions below. The new year hasn’t turned yet, but nature enthusiasts are eagerly perusing the offerings in the Arboretum Winter Enrichment Lecture series and signing up for the whole kit and kaboodle of 10 lectures or selecting just their favorite topics. Since 1968, the UW Arboretum has offered lectures for naturalists in the greater Madison area. Originally coordinated by Rosemary Fleming for Arboretum naturalists, the programs are now open to Arboretum volunteers, friends and interested public as space allows. Lectures will begin on January 10 and continue through March 14. We meet on Thursday mornings from 9:00 to 11:30 a.m. in the auditorium of the Arboretum Visitor Center. Coffee will be available starting at 8:30; programs will begin promptly at 9. Snacks are also provided by people who attend the lectures and sign up to bring them. Cost? 10 lectures for $70 per person (Friends of the Arboretum rate $60 per person). You can also register for individual lectures ($10 per person each; $8.50 FOA) at http://uwarboretum.org/events/ <http://uwarboretum.org/events/> or in person on the day of the program if space permits. Last year I attended all the Arboretum Winter Enrichment lectures. I was inspired to write a poem for almost every lecture. “Bumblebee Wisdom” commemorates the lecture on bumblebees. Here’s the beginning of that poem. You are the only one left. To read the complete poems, open the attachment noted above. You are invited to attend one of our 'Beekeeping for Beginners' classes to be held at the Dane Co. Extension Building, 5201 Fen Oak Dr, Madison, WI 53718. Saturday classes will repeat on January 19, February 23, March 23 and April 27, 2013. This class is for those with no experience at all in beekeeping. We will touch on everything you need to know for your first year. The fee of $40 covers a full day of classes, handouts, free sample journals and catalogues, and props galore for you to handle. To register, contact Jeanne Hansen at 608-244-5094 or jeanniealabeannie@yahoo.com. Cost: $40, additional family members $20 each. You may purchase artisan honey, hand dipped candles, and several other products. Bring change. Rich Schneider of Capitol Bee Supply will be on hand with woodenware and equipment for sale. read a November 13 Facebook status entry by our former County Supervisor Carousel Bayrd. I then asked her to give a few details about what the young people in these programs do. It is program currently in a few Madison middle schools, and it's been a great success in connecting youth who have some infraction or discipline issue with the individual that they have harmed, and getting the whole school involved in talking about the harm that has happened and getting both the injured and injuring student(s) to see the other side's perspective. It also is a good foundation for the youth courts in many of the high schools -- they really build upon each other." The foundation for all of this is understanding that the #1 way youth enter the criminal justice system in Dane County is through school. The success of the restorative justice program and the youth court program have reduced problems in the schools, empowered youth with empathy and understanding and perspective, and in turn reduced the number of arrests at these schools. I’m proud to increase the funding for these successful programs so that more schools and students can benefit. The schools Dane County hopes to fund will be schools with higher arrest rates, higher poverty rates, higher diversity rates. It's a small step, but a great one." In these challenging times, it’s important for counties to pursue partnerships to address challenges, protect core services, and work to strengthen communities. My 2013 budget invests in new initiatives to help Dane County’s communities continue to thrive while addressing our shared challenges. Helping kids, seniors, and the disabled comprises over 50% of the total Dane County budget. With three new child protective services social workers, including one that will work directly with the District Attorney to ensure timely prosecution of these often troubling cases, my budget makes a significant investment in keeping kids safe at a time when reports of abuse and neglect are up nearly 15% in Dane County. A new effort to reduce the time our disabled friends and neighbors wait for care will help dozens of individuals and their families become more engaged in their communities and learn job and other skills to enhance their quality of life. I’ve worked with the United Way to create an innovative new pilot project to address the achievement gap in our public schools, and help more kids succeed both at home and school in the years ahead. Alcohol and drug addiction continues to place a great strain on families and public safety. My budget includes additional dollars to help drunk drivers and drug addicts who want help kick their addiction for good and make our communities safer. My 2013 budget also makes investments to enhance our high quality of life, including a multi-million dollar effort to clean up our lakes, the biggest highway improvement budget in the past decade, investments in our green energy jobs economy, and additional resources to ensure our county parks remain crown jewels. By working together, my budget addresses our needs and invests in our families and communities to ensure all who live here have the opportunity to succeed. Starting Monday, November 12, bus drivers will be requesting employment and school photo IDs for riders boarding with an unlimited pass. Passengers without a valid ID will have their passes confiscated. Even the scammers know some of the old tricks aren’t fooling anyone. (Has anyone ever really sent money to that Nigerian prince?) So the swindlers have developed new cons designed to rip off unsuspecting folks. Here are a few of the latest scams PLUS some new protections for you! Text messages from “trusted companies.” Posing as retailers, lottery officials, or even your credit union, scammers send text messages with links to phony sites designed to steal valuable information or even cash. Misspelled words and bad grammar are other telltale signs. Gameover. The FBI sent warnings earlier this year regarding scam emails pretending to be from the FDIC, Federal Reserve or National Automated Clearing House. The emails caution that there is trouble with the recipient’s account, which can be “fixed” by clicking a link. That click installs malware (nicknamed “Gameover”) onto the recipient’s computer that can steal usernames, passwords, and even money. The FBI recommends making sure your virus software is up to date and to never give personal information online (something a credit union or bank will never request in an email). “Your computer has been infected!” You receive a phone call from “Microsoft” or an antivirus company with news that your computer has been compromised by a virus. The online helper can clean your PC from infection—you just need to give them remote access to take care of the problem. You can guess the rest: There is no virus and your computer is “cleaned” of passwords and possibly even cash from your savings account. Remember, when your computer has a problem, you call the experts, not the other way around. Today’s New York Times detailed a new kind of computer scam that is netting the scammers more money than the typical Nigerian Prince scam. In this type of scam, when you turn your computer on, you see a disturbing message that you no longer have access to your computer or any of its files. It’s true, you don’t have access. The message claims to be from the FBI, another law enforcement agency, or Anonymous, a group of hackers. Actually, a malware has been installed, dubbed “Ransomware.” You are told that the only way to get you’re your machine back is to pay a heavy fine. DON’T EVER pay the “fine.” The hackers usually don’t restore your files and you are simply out the money and still can’t use your computer. Instead, the article advises, hire a computer technician to remove this virus manually. It’s estimated that 15% of computer users who are attacked by “Ransomware” fork out the “fine” so it is easy money for the hackers who can make up to $400,000 a day! A hot topic on the “bikies” list serve is a discussion about how bicyclists should warn pedestrians they are overtaking from behind on a bike path and on what side of the path pedestrians should walk. You can test your own knowledge about pedestrian rules by reading further. Fitchburg Alder Steve Arnold posted this information he learned of from a Fitchburg staffer who communicated to the Wisconsin Department of Transportation. On roads, pedestrians are *un*intended users, and are expected to step out of the travel lane for on-coming vehicles. By contrast, pedestrians are *intended* users of the multi-use trails and paths [such as the Southwest Path] we have around here, and so follow the rules of the road, "keep right, except to pass,"
Other posts pointed out that pedestrians should walk on the left facing traffic when walking on a road, but on a bike path (multi-use path or MUP), they should stay on the right. That’s what Alder Arnold was pointing out in his post. On the other hand, bicyclists should be riding with traffic on the roads instead of against it like pedestrians do. Unfortunately, I see quite a few bicyclist riding facing traffic even when there is a bike lane. I hate to think what could happen if another bicyclist is riding correctly on the lane and a car is coming along behind. Will the wrong-way biker veer into the car or choose to hit the oncoming biker with both going down and being run over by the motorist? Not fun to contemplate. Recently, I asked a young biker coming down Whenona Drive to ride on the right, and he immediately moved from the wrong side of the street to the right (pun intended). Perhaps it would help if we all did this.